SEARCH TEAMS SCOURED the carnage of California’s most destructive ever wildfire today, with the state-wide death toll climbing to 25 as high winds and tinder-dry conditions hampered the effort to save lives. Firefighters took advantage of a brief calm overnight to make headway against the multiple blazes, but conditions were expected to be hellish today with winds reaching as high as 110 kilometres an hour. In fire zones north and south, acrid smoke blanketed the sky for miles, the sun barely visible. On the ground, cars caught in the blaze were reduced to metal carcasses, while power lines were gnawed by the flames. The largest inferno – the so-called Camp Fire in the foothills of the Sierra Nevada mountains north of Sacramento – has destroyed 6,700 homes, business and other buildings in the town of Paradise, effectively wiping it off the map. Local sheriff Kory Honea told a news conference late Saturday 14 more bodies had been found in and around the devastated community of 27,000 people. Only two wildfires have claimed more lives in California, the most recent more than a quarter-century ago. 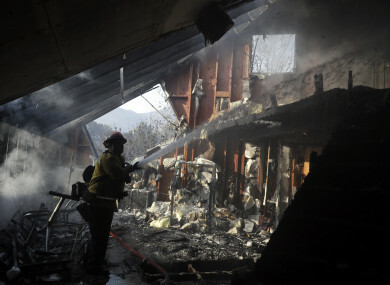 Further south, where the Woolsey Fire is threatening mansions and mobile homes alike in the celebrity redoubt of Malibu, the bodies of two people were found inside a vehicle in a long driveway, Deputy Aura Sierra of the Sheriff’s Information Bureau said. Mandatory evacuation orders have been issued for more than 250,000 people across California. Rescuers spent Saturday collecting bodies around Paradise and placing them in a black hearse. Charred body parts were transported by bucket, while intact remains were carried in body bags. At the Holly Hills Mobile Estate the mobile homes had been reduced to smouldering piles of debris. Yellow police tape marked spots that were tagged “Doe C” and “Doe D,” suggesting that bodies had been collected. Fanned by strong winds, the “Camp Fire” has so far scorched 42,500 hectares and is 20% contained, the California Department of Forestry and Fire Protection (Cal Fire) said. So far, three of the more than 3,200 firefighters deployed have been injured. Local power authorities told state officials that an outage occurred near the spot where the fire erupted, The Sacramento Bee reported, but there is no official cause of the blaze. Concerns over looting were meanwhile growing, with two so far arrested in Ventura County near LA. “If you come into these affected areas to try and take advantage of the destruction and the suffering of these residents, you will be arrested, charged and we will take you to jail,” Los Angeles County Sheriff’s Chief John Benedict said. US President Donald Trump, in France for World War I commemorations, drew criticism for an unsympathetic reaction to the devastation. The tweet also drew political criticism. Republican Senator Cory Gardner told ABC News on today: “I don’t think it’s appropriate to threaten funding. Two bodies were found in Malibu – one of the most coveted locations in California for Hollywood stars seeking privacy and luxury — in an area where the Woolsey Fire swept through, the Los Angeles County Sheriff Department. However the incident “is being investigated by the homicide department,” an LACS spokesperson told AFP. The Woolsey Fire has consumed around 83,000 acres, destroyed at least 177 structures and was 5% contained, Cal Fire said late Saturday. Evacuation orders had been issued for some 88,000 homes in Ventura County and neighbouring Los Angeles County. Reality TV star Kim Kardashian West, who lives just north of coastal Malibu, was one of the celebrities forced to flee. Director Guillermo del Toro tweeted that Bleak House, his museum of horror movie memorabilia, was safe after he saying he feared it would go up in smoke. Actor Martin Sheen, briefly reported missing by his actor son Charlie, was also forced to leave. The wildfire reached Paramount Ranch, destroying the Western Town sets used for hundreds of productions including HBO’S sci-fi western “Westworld,” network officials said. Email “Death toll rises to 25 as California wildfires rage on”. Feedback on “Death toll rises to 25 as California wildfires rage on”.